Developing a top-quality digital product, let alone a new bestseller takes a huge amount of professional skills, efforts and, certainly, time. More importantly, it also requires another crucial, yet often challenging factor – the efficient collaboration in your team. Fortunately, the latter shouldn’t necessarily be exhausting, if you’re using 4Sync. Regardless of the product complexity and scale, your need at least a small team of web-designers, developers and QA’s to handle its production from scratch. The key thing is to keep everyone aware of the production schedule and progress, along with the scope of tasks assigned to them and their priority. 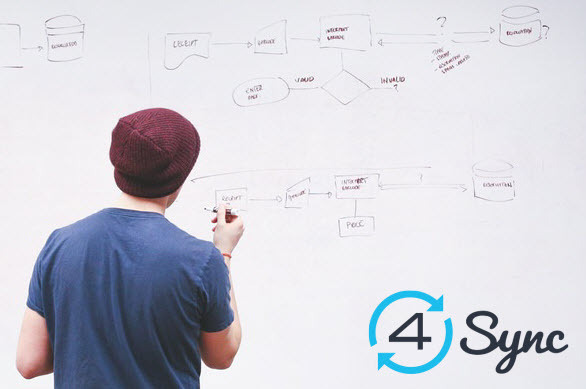 Why use 4Sync? Keeping the project data synced and accessible at 4Sync across all platforms and devices enables keeping your team informed on the latest changes and updates. Clearly, ongoing meetings and collaborative discussions are highly important for any project success. However, “many meetings” doesn’t always mean “many effective meetings.” In fact, the effective online communication in team enables you to both minimize time, wasted on another “crucial” meeting, and maximize achieved results, at the same time. Why use 4Sync? Assigning granular 4Sync access permissions to production schedule, change of task priorities and statutes or other essential data with specified sub-team, enables commenting, discussing or clarifying required adjustments online much faster and easier. Naturally, creating a high-quality digital product usually requires tons of ongoing reviews; and the better you are at reviewing product iterations, the fewer improvements their upcoming version will usually have. Why use 4Sync? Using the new “4Sync Comment Pins” feature, reviewing product design, UX/UI sketches, prototypes or their particular elements is much faster and easier. It takes a click or two to Pin a Comment to a selected area of shared graphical content at 4Sync or join others’ discussion. Team management can be overwhelming, if you fail to track the project progress and results on the regular basis. Getting daily or weekly online reports from each sub-team should, however, allows keeping things under control. Why use 4Sync? Keeping reported data in a separate folder with gradual sharing access at 4Sync enables you to avoid useless paperwork and keep all data accessible to you anytime.